A positive that came out of 2014’s boxing year in New Mexico and El Paso were more competitive matches in the area between locals and outsiders from nearing states. The fight cards that followed this formula gave us exciting and drama filled bouts. Crespin and Louishomme, Torres vs. Marrufo, Valenzuela vs. Salinas, Cabral vs. Gallegos, and Shabazz vs. Cardona just to name a few. The three fighters in consideration for 2014 SWFight.com’s Boxer of the Year award however, all tested themselves outside of the friendly confines of the Southwest. This year, the state’s most recent world champion, Austin Trout of Las Cruces, bounced back after a winless 2013 and got back into the winning column but in his two bouts suffered two shocking knockdowns against Daniel Dawson, and a less than average performance against an overwhelmed Luis Grajeda. The 2013 SWFight.com Boxer of the Year, Fidel Maldonado Jr. earned two knockout victories and went through a frustrating no contest bout against middle of the pack competition. If you asked most, Maldonado Jr. and Trout’s 2014 bouts were more along the lines of ‘stay busy fights’. This will instantly change for Maldonado Jr. in 2015 as he prepares to fight undefeated Amir Imam on January 17 in the opening nationally televised bout of a world championship card. In a surprisingly unanimous decision which included a panel made up of the Albuquerque Journal’s Rick Wright, Billy C Boxing’s Austin Killeen, Fight News’ Gerardo Martinez and SWFight.com, all voted on El Paso’s Abraham Han as 2014’s Fighter of the Year (Boxing). For most of the voters it came down to one question: Who had the most important victory of 2014? For Han, the most important win of his career came this year. With a 3-0, 2KO record, Abraham Han did face a subpar opponent Daniel Gonzalez and a journeyman in Juan Carlos Candelo but it was his victory over number two Mexican ranked middleweight Marcos Reyes in October at the Stub Hub Center in Carson, California that set his year apart from everyone else’s. Before the bout Han would meet with HBO producers where Reyes and his corner would also be present for a traditional sit-down interview. According to his trainer Louie Burke, Han would attend the conference alone and would accidentally play the ultimate mind game by telling the HBO crew that his heart wasn’t fully in boxing but instead martial arts and that he was only at the fight for a good payday. Burke recounts that Han claimed to be nervous during the interview and says that Reyes and his corner were slightly befuddled by his remarks. The opposite would be displayed by Han in the bout. Click HERE to view the entire fight. Abie Han celebrating his majority decision victory at the Stub Hub Center in California. The six-foot one-inch Reyes came into the bout with a phenomenal 32 win, 1 loss with 24 KO record, undefeated in four years. To top it off he was cornered by one of the best trainers in boxing, Robert Garcia. 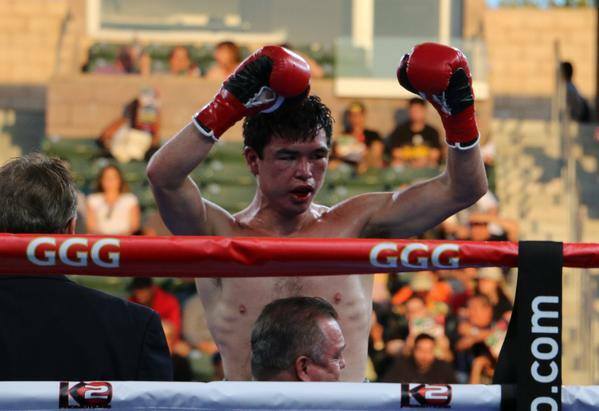 This bout, one of the better ones of 2014 for an N.M.-El Paso fighter, would be Han’s most important of his career. A grueling contest 10-round contest that would see Han kneel down to the canvass after a series of head shots in the eighth round. A desperate Reyes would strike Han after the bell in both the eighth and the ninth, being only penalized for the latter. In the 10th and final round, Han would finish strong shaking off a Titanic uppercut delivered by Reyes and defended himself by throwing power flurries of his own. He would even resort to bullying Reyes against the ropes to waste time. Both men’s faces would show signs of a strong contest. The right side of Han’s face almost unrecognizable. After a lengthy delay in the tabulation of the score cards and Han would be awarded a majority decision. With the victory Han improved his record 23-1, 14KOs. Han holds the highest winning percentage out of any fighter in the New Mexico-El Paso region with more than 15 fights. For Han, Trout and Maldonado Jr. 2015 will be the most important. Han will look to piggyback off his huge win, Trout will look for a top 15 opponent and Maldonado Jr. will likely see his stock rise with a win over Imam. If all three men have a successful 2015, it is going to be a hell of a task to select a Fighter of the Year. *Han finished with 4 out of 4 first place votes.